Any government trying to deal with a terrible event like the Grenfell Tower disaster needs sensitivity and nimbleness. Ministers have a complicated "to do" list - make sure help gets to where it is required, turn on the taps for emergency cash and show that it is willing and brave enough to work out how it could have happened, in order to give any credible answer to the common cry of "something must be done". But this government is already so fragile, facing pressure on many fronts, the PM still reeling from the election result only a week ago. This is a huge political challenge that would test the most secure and most deft team, not least because the grim expectation at Westminster is that any inquiry may suggest that over the years, successive generations of politicians have just not paid enough attention to social housing. There are layers of accountability here, the housing association, the developers, the council, the government, but few expect the political class will be covered in glory. 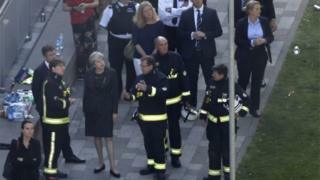 And while the prime minister's decision not to visit victims but fire crews and volunteers instead was made, Number 10 believes, for the right reasons, it may, in time prove to be a miscalculation. Moments like this can require empathy, not just getting on with the almost impossible job.